Juventus manager Massimiliano Allegri has dismissed speculation that he is on the verge of agreeing a contract with Arsenal. The Premier League outfit are set to undergo a managerial change for the first time in more than 20 years. Long-term boss Arsene Wenger looks set to step down from his role at the end of the campaign. His current contract expires in the summer, and there has been a lot of silence from the Frenchman about his future. Wenger would have extended his stay at the club if Arsenal had been challenging for top honours. However, three defeats in the last four games has left the club outside the top four. They have also suffered a 5-1 defeat against Bayern Munich in the first leg of the last 16 game, thus leaving the club on the verge of an exit from the Champions League. Arsenal have witnessed a number of Italian managers succeed in the Premier league over the last decade. The likes of Carlo Ancelotti and Claudio Ranieri are testaments of the success achieved by the Italian managers. More recently, Antonio Conte looks to be on the verge of creating history with Chelsea. 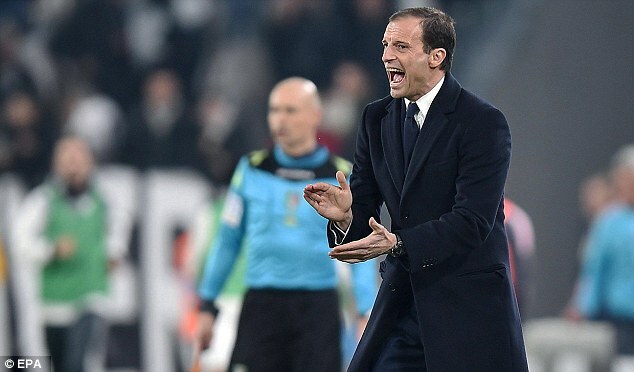 Allegri has been one of the top-rated Italian managers over the last five years. Amidst constant speculation about a move to Arsenal in the summer, Allegri has dismissed those rumours. "I repeat what I have already said before, it's not true. The second thing, even if there was something in it, the first to know and learn my wish to leave would be Juventus.I'm contracted until 2018. I'm not the one to decide my future, Juventus will. It is they who decide because it's the way I work and have worked previously.When time passes, as we did last year, we will evaluate what to do.And if these rumours were true, Juventus would be the first to know and I haven't talked to Juventus yet," said Allegri.